(ANDOVER, Massachusetts) – The second annual Step Up for Colleen 5K will be held in Andover this Sunday, May 3, 2015 at 9:00 a.m. in memory of Colleen Ritzer. Proceeds from the event will support the Step Up for Colleen Fund at Essex County Community Foundation, which benefits the Colleen E. Ritzer Scholarship Fund that provides college scholarships to high school graduates who pursue education as a major and reflect Colleen’s values. Some 4,000 registrants participated in the inaugural Step Up for Colleen 5K. “The 2014 event exceeded all expectations,” says race director Nina Caron, who expects a similar turnout of runners and walkers this weekend. “The 2015 race features several enhancements, including a USA Track & Field certified course and youth-sized shirts,” she adds. Online registration ($30.00) closes at 7:00 p.m. today, Wednesday, April 29. After that, in-person registration ($35.00) is available at the Andover Spine Center/Chiropractor office (Park Street Village, 63 Park Street, 2nd Floor, Andover, MA) on Friday, May 1 from 11:30 a.m. – 7:00 p.m. and Saturday, May 2 from 9:00 a.m. – 5:00 p.m. On Sunday, May 3, registration will be in the Doherty Middle School cafeteria (50 Bartlet Street, Andover, MA) from 7:00 a.m. until 8:45 a.m. Cash or checks (made payable to ECCF/Step Up for Colleen Fund) are preferred, but credit cards will also be accepted. Details about the Step Up for Colleen 5K are available at www.stepupforcolleen.com. The website features information about Colleen Ritzer, an online volunteer sign-up page, and a video of the race course. The site also features a ‘social wall’ that collects and shares the reasons why individuals have decided to #StepUpforColleen. The purpose of the wall is to allow participants a forum to inspire others to #StepUpforColleen. 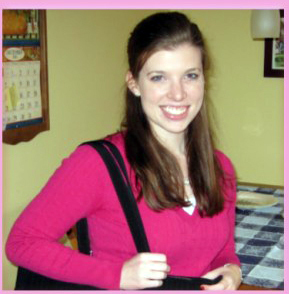 Colleen Ritzer, a lifelong resident of Andover, passed away on October 22, 2013. She was a 2007 graduate of Andover High School and a 2011 graduate of Assumption College. Colleen was pursuing a graduate degree at Salem State College and was a math teacher at Danvers High School. She adored spending time with her family and friends, and was an amazing daughter and big sister to her brother and sister, Daniel and Laura. She left a lasting impression on everyone she met. From a young age, Colleen knew she wanted to be a teacher and worked diligently to achieve her goal. Even though teaching was her profession, it was also one of her favorite hobbies and her passion. She spent countless hours finding unique and creative ways to inspire and teach her students. The Step Up for Colleen Fund supports charitable activities that honor the legacy of Colleen Ritzer, including the Colleen E. Ritzer Scholarship Fund, which benefits Andover and Danvers High School seniors who demonstrate a passion for teaching, academic excellence, and love of family.